Johannes Gramich has worked in older people mental health community teams in Weston-Super-Mare, in Trowbridge in Wiltshire and, since 2006, in Cardiff. He has obtained his social work certificate and Master’s degree from Bristol University. 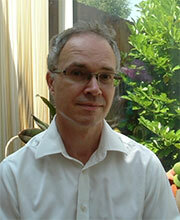 He is also a qualified practice teacher and a registered dementia care mapper. The areas he is mainly interested in are carer support, approaches to activity work with people in the early stages of dementia and the role of social work within dementia care.